​The Spherical Plain Bearing GEZ.ES 2RS Series is a support. If the transmission member is directly matched with the hole, the transmission resistance is large, and after the wear is large, the transmission member is not easily replaced. The bearing relies on the rolling contact between the components to support the transmission parts, so the sliding resistance is small, the power consumption is small, and the starting is easy. 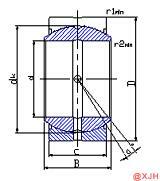 The Spherical Plain Bearing GEZ.ES 2RS Series is a support. If the transmission member is directly matched with the hole, the transmission resistance is large, and after the wear is large, the transmission member is not easily replaced. The bearing relies on the rolling contact between the components to support the transmission parts, so the sliding resistance is small, the power consumption is small, and the starting is easy. Spherical Plain Bearing GEZ.ES 2RS Series selection needs to refer to more factors, and bearing load conditions are only one of the factors. The choice of joint bearing needs to be considered in terms of lubrication conditions, temperature, sliding speed, etc. to select refueling or non-oiled joint bearings. There are many causes of bearing damage, such as improper installation, dirt intrusion or moisture intrusion, which are common causes of early damage in many bearings. Analysis of common causes of damage to bearings and corresponding precautions that extend the life of joint bearings.